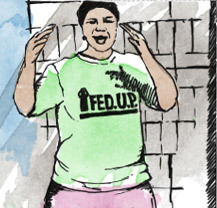 FEDUP has eight saving schemes in QwaQwa. 50 members from two saving schemes, namely Phutaditjhaba and Matebeleng have benefited from the recently completed housing project of 50 houses. The members reside in the following settlements: Makeneng, Phukeng and Thabong. In the process of development, members were not relocated as houses were built within each member’s stand. The project began on the 2nd of April 2009 and was completed on the 22nd of March 2011. 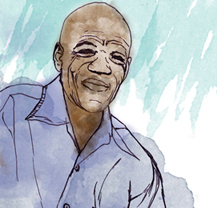 Just like all the other FEDUP projects, a People’s Housing Process was followed. A community construction management team (CCMT) was established prior to the commencement of the project. The CCMT was comprised of six members (five female and one male). FEDUP in Free State has had successful and productive engagements with its government, however there were challenges faced in the process. The first and most positive development was the successful negotiation, agreement and issuing of ‘upfront subsidies’. According to the QwaQwa CCMT, the major challenge that was faced during the project was the delay in payments by the province. Payments from the province were done in batches that varied in number and the payment delays came between one batch and the next. During engagements with the government through Joint Working Group meetings, the FEDUP representatives presented the issue, however the government is said to have shifted the blame to FEDUP asserting that they delayed to submit PTOs (Permission to Occupy) for their beneficiaries. Instead of title deeds, the QwaQwa beneficiaries reside in an area controlled by the Chief who is responsible for the issuing of PTOs. FEDUP however maintains that they always submitted their PTOs on time. In the combined saving scheme meeting held on the 30th of May 2011, the regional leader Emily Mohohlo encouraged the beneficiaries to continue saving as well as completing their contribution towards the Urban Poor Fund. Members that benefited from the project have continued to save and most of them are saving for plastering and putting ceiling in their houses. Marshall Fishwick once said ‘A person with half volition goes backwards and forward, but makes no progress on even the smoothest of roads’. 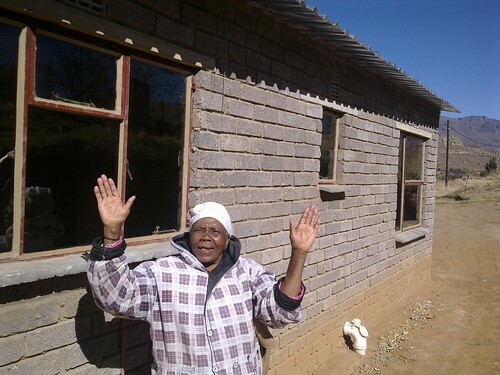 72-year-old “Gogo” Goalone Mahlala is an example for the opposite: She followed all the rituals of the federation and at the end was not only overjoyed by her efforts towards achieving her dream house, but also an improved life through support from her saving scheme members. 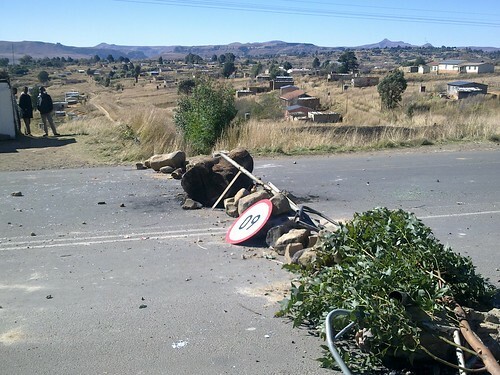 The meeting was accompanied by ongoing service delivery protests in QwaQwa. 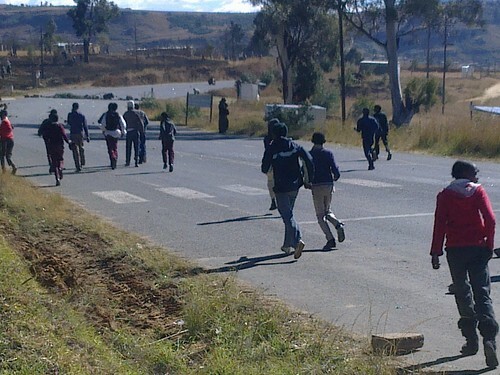 The protests began on Monday and were being led by students from surrounding schools. The councillor’s house was burnt down yesterday morning. Myself and three Federation members from Bothaville and Odendaalsrus could not leave QwaQwa on Monday as had been scheduled. All main roads were blocked. The saving scheme and CCMT meetings were not affected as they were held indoors, however the practise of Nsukuzonke (daily savings collection) had to be stopped early for safety reasons.